YZ450FM, 450F and YZ250F machinery were dominant forces in the first round of the 2008 Italian Motocross championship as Yamaha riders captured all the overall podium places in both MX1 and MX2 categories at a sunny Montevarchi circuit. It was another successful double-act for Yamaha Motocross Team痴 Josh Coppins and David Philippaerts after their 1-2 results at the Mantova Starcross International a week before. This time it was Coppins・turn to take the top step of the rostrum after the New Zealander produced two strong performances to walk away with the chequered flag in both motos. Philippaerts was second on both occasions as is now the 叢rovisional・leader of the standings as his team-mate will not contest the full series. 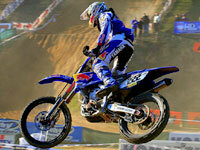 MX1 was largely a contest between the two factory riders. Coppins led the first race with Philippaerts doggedly hanging onto his tail. After 22 minutes Philippaerts took his chance and relegated the winner of five Grand Prix in 2007 to second spot. Coppins remained composed and watched the lines of the Tuscan before counter-attacking within the final two laps to seize the victory. MX2 World Champion Antonio Cairoli was third in both sprints with just his second appearance steering the Yamaha Red Bull De Carli YZ450F. 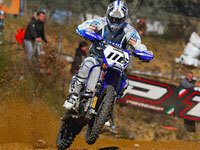 The 2007 MX2 Italian number one made a steady and solid beginning to his 2008 calendar. Cairoli痴 crown in MX2 looks as though it will be closely fought over this season. In Montevarchi the class was decided between Yamaha Team Ricci痴 Nicolas Aubin (the eventual winner with 2nd and 1st positions), Davide Guarneri (5th and 3rd places) and 3C Yamaha痴 Manuel Monni (winner of the first moto and 5th in the second). Yamaha Red Bull De Carli痴 Matteo Bonini is also likely to play a part ・and will try to keep the number one plate within the realms of the Rome-based squad ・as his fine second position in the last sprint (and fourth overall standing) reveals. The second round of the series follows quickly with the Yamaha Motocross Team and the three MX2 squads in action next weekend at Castiglione Del Lago. Coppins will head north-west to race the Valence International in southern France.